I actually like it ... though I didn't vote for it on a recent poll. 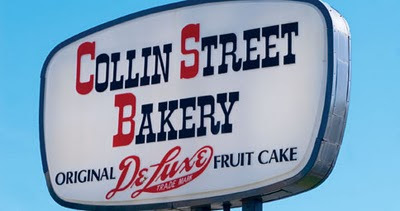 The Collin Street Bakery is a bakery in Corsicana, Navarro County, Texas, most famous for its DeLuxe Fruitcakes, which it ships to more than 150 nations annually. The bakery was founded in 1896 by August Wiederman, an immigrant from Wiesbaden, Germany. With the help of local entrepreneur Tom McElwee, the bakery soon outgrew its original building, and required a new one of such size that the second floor was turned into a hotel. Celebrities such as Enrico Caruso and Will Rogers were sighted at the bakery, and in 1914 the Ringling Brothers Circus passed through town and ordered dozens of fruitcakes as Christmas gifts to be mailed to friends and family across the globe. In this way, the bakery entered the mail-order business. .... Descendants of the Ringling circus family continue to place orders each year. Monaco's Princess Grace also placed an annual fruitcake order, a tradition that Princess Caroline continued after her mother's death. Basketball star Julius Erving is also a regular customer. The company rejected an order from Iran's Ayatollah Khomeini following the 1979 Iranian hostage crisis. By the way, there's now a Collin Street Bakery in Waco - on I-35. Both locations have other superb delicacies, besides fruitcake. Mmmm. I have lots more to tell you, but I'm tired... and somewhat frustrated: our refrigerator has died - and the repairman can't come for another week! Hmm. We have a big freezer that works - so maybe frozen milk and eggs would be okay? Q: Did you hear about the guy who played golf on Christmas and accidentally hit a bird? A: He got a partridge on a par three. Oh, I forgot to tell you that the absolute best fruitcake I've ever eaten in my whole life was made by my Granddaddy Earl (Mother's father). There was no 'cake' in it - just lots of fruit- and coconut! ... And Granddaddy Earl couldn't even eat it - he was diabetic!! Oh, a new poll is up. I love fruit cake. Making one was a two day event when I was a kid what whit shelling walnuts, cutting up all the bits of fruit, and what have you. Great fun. I haven't made one the past two years because Mark can't eat much of it, and I certainly can't eat that much. Our recipe is a very old one, passed down through many generations. My aunt always made fruitcake for Christmas and gave them away for gifts. I never really appreciated fruitcake until I read how long it takes to make one . I wonder if my cousin has that recipe. Poll: Sleigh Ride is my fave. I messed up on that last post...looks like it won't let me go silently. 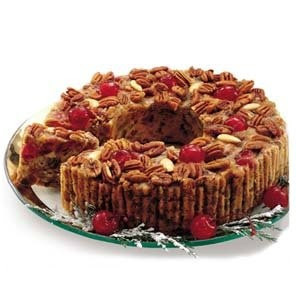 Anyway, what I was saying is my favorite fruitcake was Grandpa's also...I agree with you...it was the best. Right behind that was his fig pies...figs fresh off his trees in the backyard. His pie crusts were heavenly! And here he was a big rig truck mechanic for a living...a most unlikely person to be such a great baker!! Ah, ther ei go profiling again! Nancy, Kevin and I recently had lunch at the Collin Street Bakery in Waco, and I took a little trip down memory lane. I remember having a Collin Street Bakery fruitcake in our home every year at Christmas time. I remember SELLING those fruitcakes as the band fundraiser (which is why there was one in our house every year). Now, there are so many varieties. And some of them struck me as PRICEY. Oh, well . . . I guess inflation hits pretty much everything sooner or later. Even fruitcakes. Collin's Street Bakery- hands down!! We have to have at least one for the Christmas Holiday. !